A Girl Named Sejal Thanks Shah Rukh Khan Over Jab Harry Met Sejal Title, His Reply Is EPIC! 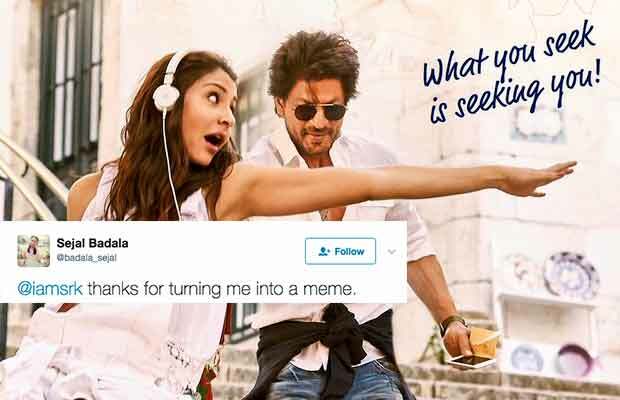 Shah Rukh Khan’s reply to this girl tweeting about Jab Harry Met Sejal will leave you laughing! It was a day before yesterday when Bollywood actors Shah Rukh Khan and Anushka Sharma revealed the title of their much-awaited film. Directed by Imtiaz Ali, the film has been titled ‘Jab Harry Met Sejal’. Some of the fans are quite happy with the title, while some of them are disappointed. Most of the fans feel that the title has been taken from the Hollywood romantic comedy When Harry Met Sally. Some others are saying that it has been inspired from Shahid Kapoor and Kareena Kapoor Khan starrer Jab We Met. There are also people who do not like the names Harry and Sejal in the title. A girl of the same name tweeted saying, “@iamsrk thanks for turning me into a meme.” We know how social media is right? The names have become a ground for a number of memes and that was what the girl is talking about. @iamsrk thanks for turning me into a meme. Earlier tweeting about the title, SRK had said, “Just in case Ranbir Kapoor ever claims it…the title Jab Harry Met Sejal was never ever suggested by him! So he doesn’t win the Rs. 5000 reward.” And later at the song launch of Galti Se Mistake from his upcoming film Jagga Jasoos, Ranbir said that he wants his money and will go to Mannat for getting it from Shah Rukh. Well, we don’t know about the title but the first look of the film is very vibrant and has left us excited for the trailer! Previous articlePolice Complaint Filed Against Kangana Ranaut In Accusation Case!